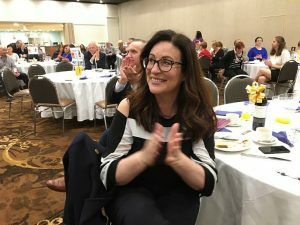 Popular Daily Telegraph columnist Miranda Devine,, who was guest speaker at a Rotary club business breakfast in Wests Leagues club this morning, did not pull any punches when asked about bullying of female politicians in Canberra. When Miranda Devine says that bullying is mostly done by women against other women, enthusiastic applause breaks out in the Wests Leagues club auditorium this morning. 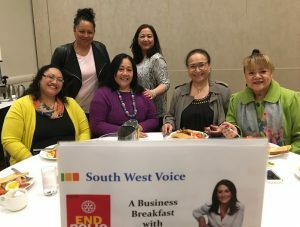 Ms Devine was the guest speaker at a business breakfast organised by the Campbelltown Rotary Club to raise funds for the campaign to eradicate polio across the world. Before Rotary president Murray Kear introduced the guest speaker he informed the 80-odd guests who had booked a place that by coming to hear Miranda Devine they had helped raise enough enough money for 4,000 innoculations against polio. Known for her conservative views, Ms Devine traversed the ins and outs of recent political events during her speech. She spoke about the rise of gender identity politics and how even conservative governments have been unable to push back against progressive social change. “You’ve seen the rapid spread of gender ideology through our schools – Safe Schools may have been dreamed up by the Gillard Government, but it was launched and funded by the Abbott Government,’’ she said. Ms Devine also spoke about the future of the media and politics and suggested Labor would “probably’’ win the next election. Asked a question about bullying of female MPs in the Liberal Party and the proposition that more women in politics would help eradicate bullying, Ms Devine did not pull any punches in responding. “Coming from a family of all girls and having gone to all girl schools, women are the worst bullies; and all the women here are clapping because we know,’’ she said. “Female bullying is in some ways worse because at least males do it out in the open and you can call it out. “Female bullying is covert, it’s very clever, and we hone our skills in the playground from early on,’’ Ms Devine said. Some of the audience at the Miranda Devine business breakfast.